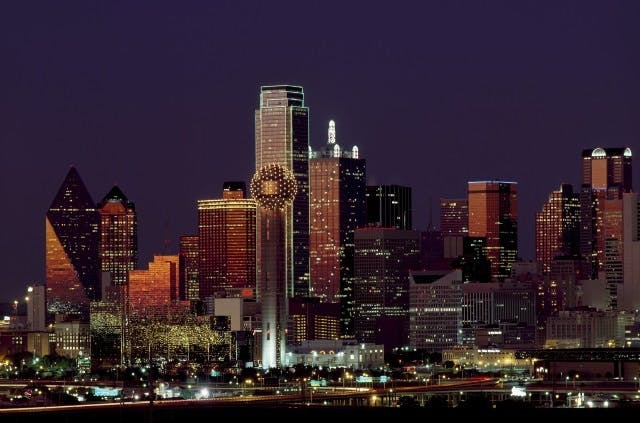 The Dallas/Fort Worth Metroplex is a diverse and exciting area located in beautiful North Texas. It offers a friendly culture, excellent steak houses, arguably the world's best barbecue, a wide variety of musical and artistic venues, and world class sporting events. It is home to the Fort Worth Stock Show and Rodeo, and the smaller yet still exciting Mesquite Championship Rodeo. Four major sports teams, the Dallas Cowboys, the Texas Rangers, the Dallas Mavericks, and the Dallas Stars claim the Dallas/Fort Worth as home, and Texas Motor Speedway hosts NASCAR and Indy racing events. Many lakes and parks are located within or just outside the metroplex. From world class food, entertainment, and sports, Dallas/Fort Worth offers something for everyone. The Coordinated Universal Time adjustment for Dallas/Fort Worth is -21600. The nearest train station to Dallas/Fort Worth airport is Terminal C20-C39 located at Access Road, Irving . 40 airlines fly to Dallas/Fort Worth. To name a few: United Airlines, Air New Zealand, Icelandair, Royal Jordanian, American Airlines, bmibaby, Emirates.